This Repair Parts section tells you what you need to know to purchase service parts for your major home appliances. It will walk you step by step through the information you need, show where to find it and also explain some potential pitfalls along the way. Browse the 'Glossary of Terms' to find the actual name of the part your looking to replace. The 'Who Makes What' section shows the manufacturer behind the appliance's brand name to help you find the most appropriate part supplier for your particular product. Be sure to read the 'OEM vs. Generic Parts' and 'Don't Be Surprised' sections thoroughly so you can be fully prepared. The 'Part Lists' page has links to manufacturer and supplier sites that contain parts breakdowns and schematic diagrams available on-line in various formats. Once you find the part number of the component needed, use the Appliance411 'Availability Search' feature to find a supplier with the part available on-line. If you need an owner's or repair manual, see the Appliance411 Home Service section for links to various resources. The RepairClinic offers a top notch on-line catalog of replacement parts and accessories for most brands of major home appliances. By entering a manufacturer's part number you can search their catalog to see actual part photographs along with their description, price and often links to related items. If you don't know the part number you need, you can use their unique PartDective� feature to browse the catalog by product brand and type. The PartDetective� steps you through the selection process by asking you a series of questions to narrow the range of items to display. The questions asked include appliance brand, product type, whether the part is electrical, metal or plastic, its color and approximate size. Once finished, the PartDetective� displays components for that brand and product type along with their photographs and descriptions. The results are sorted by the criteria you've entered so the most likely items appear first. 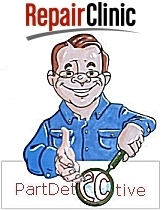 The RepairClinic also offers on-line repair help and tips for troubleshooting appliance problems plus FREE repair advice from the RepairGuru� via email.